Solar Bear is an award-winning theatre company established in 2002 with the aim of developing new multidisciplinary theatre-making processes in order to create exciting, pioneering, accessible theatre of the highest quality for and with people of all ages. 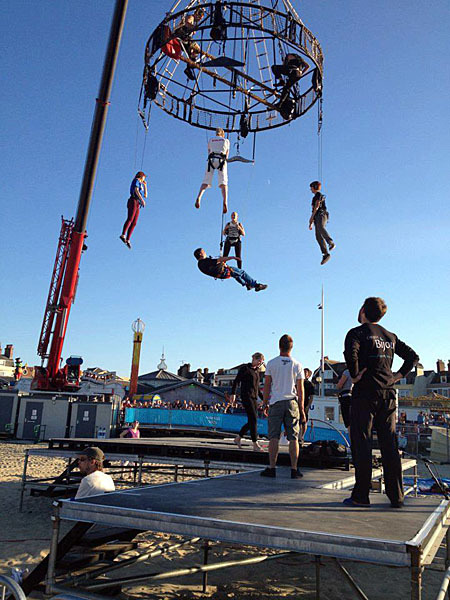 The Company aims to ensure that their work, both the learning strand and main stage productions, is accessible to as wide a range of people as possible. To this end they have worked with a broad variety of excluded groups. The Company is also passionate about artistic developments in regard to inclusive work from an aesthetic point of view, and has integrated audio description and British Sign Language into on-stage action. In this respect Solar Bear is often regarded as a leader in the field. The organisation has been at the forefront of theatre work with d/Deaf young people and adults through its d/Deaf Youth Theatre and d/Deaf Theatre Club. It runs a d/Deaf Theatre Skills course in partnership with The Royal Conservatoire Scotland and this partnership will see a groundbreaking BA Deaf Performance degree course for individuals with hearing difficulties launched in September 2015. Solar Bear work with schools, community groups, organisations and charities delivering workshops and projects. They run a Therapeutic Theatre Programme and have a team of freelancers who deliver outreach workshops. Solar Bear have delivered workshop programmes in Gartnavel Royal Hospital, St Roch's School and Deaflinks in Dundee. They have also worked with charities such as Action for Children, Who Cares Scotland and Young Carers, Scotland.